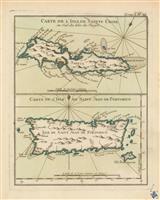 Description: Early map of Puerto Rico. Decorative cartouche and sea monsters. Coloured. Description: San Juan. Plan of the town and harbour. Coloured. Description: Puerto Rico and St. Croix. Two maps on one sheet. Original colour. Description: Harbour of Puerto Rico showing the town and bay. Hand coloured. Description: Puerto Rico. Chart of the main harbour. Coloured sea chart. Description: Puerto Rico and the Virgin Islands. Map surrounded with panels of French text describing the region. Cartographer: Sifton Praed & Co. Description: San Juan. Coloured miniature map.